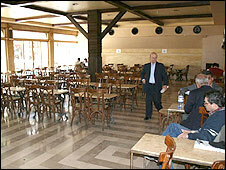 Syria has become the first Arab state to implement a ban on smoking in public places, such as restaurants and cafes. The decree also outlaws smoking in educational institutions, health centres, sports halls, cinemas and theatres and on public transport. Workers must not smoke during meetings and businesses need to provide well-ventilated areas for smokers. The restrictions include the nargile, or hubble-bubble pipe, which is popular among locals and tourists. The decree was signed last November by President Bashar al-Assad, a qualified medical doctor. According to the official news agency SANA, fines for violating the ban range from 500 to 100,000 Syrian pounds (US$11 to $2,169). 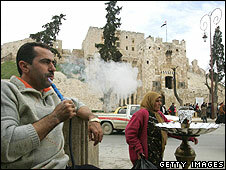 The BBC's Lina Sinjab in Damascus says the ban has upset many in a country heavily addicted to nicotine. In one of the city's traditional cafes, Cafe Rawda, on the first day of the new rules, the inside area was deserted but the outdoor terrace was busy with customers smoking shisha pipes, she reports. Cafe owner Ismat Kosoros said he feared the ban would take a heavy toll on business. "There are customers who have been coming here for forty years. And in hot summers, it is hard to have people sitting in courtyard, they need an air-conditioned area," he said. But there are members of the younger generation who welcome the decision as good for public health - even if they still smoke themselves - our correspondent reports. The Syrian government has passed several laws restricting smoking in the last two decades. A decree in 1996 banned tobacco advertising while a 2006 law outlawed smoking on public transport and in some public places, introducing fines for offenders. Under-18s are not allowed to buy tobacco. The World Health Organization is unable to provide details on tobacco consumption in Syria, but levels of smoking in public is high across the Arab world, especially among men. Last year Iraq's cabinet agreed a draft law outlining similar measures, causing uproar amongst smokers.